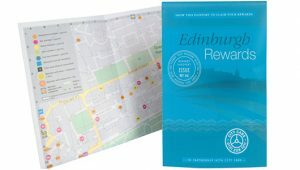 The Edinburgh Rewards Passport is exclusive to Edinburgh Conference Delegates. Your rewards passport opens up a wide variety of discounts for you to take advantage of while in Edinburgh. As proud partners of the Edinburgh Rewards programme we are delighted to offer all delegates a £1 Discount on all journeys while in Edinburgh. To claim, either quote ‘Edinburgh Rewards’ when calling us on 0131 228 1211or show your passport to your driver. Call 0131 228 1211 and quote ‘Edinburgh Rewards’. The best way to book is through our iPhone and Android App. It allows you to book and cancel journeys, track your vehicle as well as giving you the option to pay by card. Online through our online Web Booker. If the conference you are attending is yet to make arrangements for you to receive your Passport then do email hillary.bett@marketingedinburgh.org. We remind you that your passport is provided completely free of charge, we only ask that your conference organisers ensure the distribution of the passports. If you require more information. Head over the Convention Edinburgh page.